An 18-year-old student from Hemyock wowed judges at an annual beauty therapy contest in London a fortnight ago. 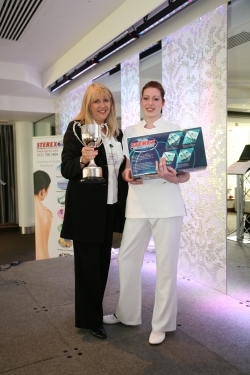 Amy Grimshaw won the Sterex Student of the Year Competition 2007 at the Roof Gardens Hotel in Kensington on June 13. The competition is designed to test the skills of epilation beauty treatments - a specialist skill which involves the permanent removal of unwanted hair growth. Amy, studying an NVQ Level 3 in Beauty Therapy at East Devon College, said: "I can't believe I actually won and it still feels unreal." Entrants were short-listed from all over the UK and Amy was among 11 other finalists competing for the accolade. She was presented with a large silver cup, a Sterex blend epilation machine and either £1,000 in cash or an all-expenses paid trip to San Francisco. Amy added: I have to thank everyone from the college, particularly my lecturers for their wonderful support and encouragement. "I'm thrilled that I've won. The competition was scary and I was incredibly nervous, but this has really boosted my confidence and self esteem." Amy's lecturer Nikki Gilbert has also won the chance to take the cash or the trip to America. If they both opt for a visit to the States they will visit the American Electrolysis Association in San Francisco where they will take part in seminars.